With a knockout rate of over 60 percent, Manny “Pac-Man" Pacquiao is the first eight-division world champion. He's won ten world titles. To honor this impressive achievement, the Boxing Writers Association of America named him as the first "Fighter of the Decade" in the new millennium. 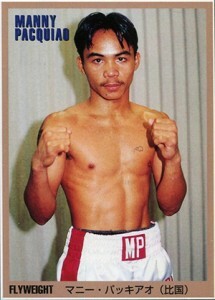 Collectors don't have a ton of Manny Pacquiao cards to choose from, but many of those that do exist are very impressive. A native of the Phillipnes, Pacquiao combines a rigorous training and fight schedule with politics. The rookie congressman is particularly proud of this achievement and takes his job representing his constituents just as seriously as he takes his in-ring opponents. Named by Forbes as one of the highest paid athletes in the world, his global name recognition also caused Time magazine to include him in their annual rankings of the world's most influential people. Capturing upon his wide-spread popularity, Topps released the fighter's only rookie card in its annual release of 2011 Topps Allen & Ginter Baseball. Pacquiao's autographed items are also in strong demand. Signed gloves, fight shorts, posters and photographs are all available on the secondary market at a range of prices. Due to his global popularity, collectors need to be cautious and educated in purchasing his signed pieces. 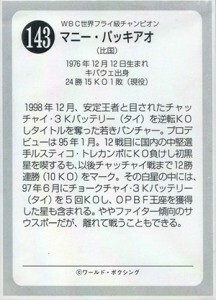 The first known Manny Pacquiao card was included with a Japanese magazine. Not only that, but it was part of a sheet of four cards. So not only is it rare, but the fact that it needed to be separated makes top-condition copies even tougher. Prices reflect that. In-tact sheets can sell for more than $200. Professionally graded Gem Mint cards approach $1,500. Many collectors don't consider magazine inserts to be rookie cards. So from a traditional perspective, Manny Pacquiao's first pack-inserted card didn't come until much later in 2011 Topps Allen & Ginter. All of his other cards released thus far have been inserts, autographs and memorabilia cards. 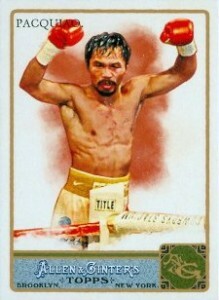 The card features a stylized picture of Pacquiao raising his arms, presumably in victory. Below you will find an example of what Manny Pacquiao's authentic signature looks like. This can be used as a first point of reference for determining the legitimacy of autograph memorabilia, but is not a substitute for having your items authenticated by a well respected professional autograph authentication company. Some of the trusted sources within the sports memorabilia market include the following companies: PSA, JSA, Steiner, Tristar and Mounted Memories. Click on any of the images below to view full size photos. Signature is usually written on an upward angle and very fluid with few starts and stops. Very hard to decipher lettering. The word "Pacman," his nickname is legible and in quotation marks. The first and last characters of the top name in the signature are very similar, which are the letters "P" and "o." Manny’s true RC is the 1999 Japan World Boxing card. The A+Gs are nice though! MANNY PACQUIAO AUTOGRAPHED 8X10 COLOR PHOTO (BOXING) - PSA DNA!